China Daily reports that China's bank loan total exceeds full-year target. China's banks extended a surprisingly large amount of new loans in June, more than doubling that of May's, while driving up possibilities of bad loans and excessive production capacity amid a credit boom. Preliminary calculations showed that new lending was 1.53 trillion yuan, the central bank said on its website yesterday, bringing total lending this year to 7.4 trillion yuan, far exceeding the country's initial full-year target of disbursing 5 trillion yuan in loans. Total lending so far this year amounted to almost one quarter of last year's GDP. June's figure was the third-biggest monthly sum this year, after the 1.89 trillion yuan lent in March and the 1.62 trillion in January. The surge in June loans is a result of the government's decision to pare the equity capital requirement of fixed-asset investments in May, Liu Yuhui, director of the Center for Chinese Economic Evaluation at the Chinese Academy of Social Sciences, told China Daily. The equity requirement for railway, road and metro projects was lowered to 25 percent from 35 percent, while the ratio for airport, port and inland shipping construction was lowered to 30 percent from 35 percent. "The lower requirements for infrastructure-related investment projects mean that it will be easier for the local governments to borrow from banks to fuel local infrastructure construction," Liu said. Reuters reports that China June loans beat forecasts. BEIJING, July 8 (Reuters) - Chinese banks extended an eye-popping 1.53 trillion yuan ($223.9 billion) in new loans in June in a fresh show of support for the government's drive to hit its target of 8 percent economic growth in 2009. The burst of lending last month, up from 664.5 billion yuan in May, took total new credit for the first half of the year to 7.37 trillion yuan, or almost 25 percent of last year's gross domestic product. The People's Bank of China, the central bank, announced the figure on its website, www.pbc.gov.cn, in a brief statement. Wang Huaqing, the discipline commissioner at the China Banking Regulatory Commission, on Tuesday said banks should spread risk by syndicating big loans for projects like railways and airports. More broadly, Premier Wen Jiabao and his advisers agreed recently on the need to keep inflation in check, given the massive stimulus coming from the surge in bank lending and the government's 4 trillion yuan stimulus package. A Reuters poll released on Tuesday showed economists were unanimous in expecting no change in borrowing cost rates or banks' required reserves in 2009 or the first half of 2010. But the PBOC has already started to nudge up money market rates, prompting a partial buyer's strike in the bond market on Wednesday. The Ministry of Finance failed to sell out a one-year auction as dealers held out for a higher yield. The central bank also said on Wednesday that it would resume sales of 12-month bills, suspended since mid-November, to drain cash from the banking system. 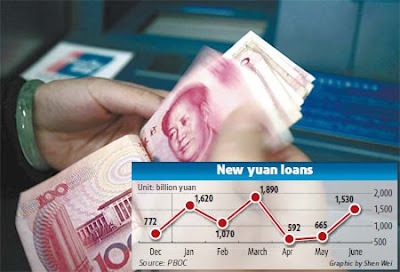 The new-loan total for June was much higher than the estimate of 1.2 trillion yuan given in recent days by state media and suggested that banks had defied instructions from the China Banking Regulatory Commission (CBRC) to avoid sudden lending surges at the end of each month and quarter. June's figure was the third-biggest monthly sum this year, falling short of the 1.89 trillion yuan lent in March and the 1.62 trillion disbursed in January. The government initially said it wanted banks to lend at least 5 trillion yuan this year. Bloomberg reports that China debt auction falls short as central bank tightens policy. July 8 (Bloomberg) -- China failed to complete a 28 billion yuan ($4.1 billion) government bond sale for the first time, as the central bank withdrew cash from the financial system to reduce inflation pressures. The Ministry of Finance sold 27.5 billion yuan of one-year notes at a yield of 1.06 percent, compared with 0.89 percent at the last auction of similar-maturity debt in May, according to Chinabond, the nation's biggest debt-clearing house. Later, the People's Bank of China it said will resume the sale of one-year bills tomorrow after an eight-month suspension. "The failure to sell all government bonds in an auction is quite rare," said Nie Shuguang, a fixed-income analyst at Industrial Bank Co. in Shanghai. "Investors are worried the central bank will fine-tune its monetary policy and drain capital from the financial market." China is seeking to choke off supply of money to speculative stock-marke t and real-estate investments, without derailing its 4 trillion yuan economic stimulus plan by raising benchmark borrowing costs. The government needs to "fine-tune" monetary policy to prevent asset bubbles, loan defaults and rapid inflation, Zhang Jianhua, head of the central bank's research bureau, wrote in the China Finance magazine this month. The yield on the 2.76 percent treasury note due February 2016 rose 1 basis point to 2.85 percent at 4:30 p.m. Shanghai time, and the price of the security fell to 99.46 per 100 yuan face amount, according to the Interbank Bond Market. China's bond market swelled in size to about $2.2 trillion at the end of March, compared with $1.9 trillion a year earlier, paced by corporate bond sales, according to the Asian Development Bank. Demand has been waning in recent weeks. An auction of 28 billion yuan of five-year government securities on July 3 drew bids for 1.42 times the debt on offer, compared with a 1.65 bid-to-cover ratio in a sale of 28 billion yuan of 10- year notes on June 17. The People's Bank has been draining funds from the financial system. The yield on the 28-day bill repurchase agreement climbed 10 basis points in open market operations in the past week to 1 percent, after being unchanged for six months. A basis point is 0.01 percentage point. The central bank plans to auction a combined 100 billion yuan ($15 billion) of bills due in three months and one year tomorrow, the most since September 23. Chinese lenders extended 1.53 trillion yuan of new loans in June, more than doubling that in May, the central bank said today. "The central bank is fine-tuning its monetary policy," said Yang Hui, a fixed-income analyst with Citic Securities Co. in Beijing. "Banks have made too many loans, which has helped drive up housing prices." The resumption of initial public share sales has further strained supplies of cash. China's securities watchdog has since June 18 allowed three companies, including Guilin Sanjin Pharmaceutical Co., Zhejiang Wanma Cable Co., and Your-Mart Co., to proceed with plans to sell shares after a nine-month moratorium. China's consumer prices dropped 1.4 percent in May from a year earlier, after falling 1.5 percent in April, according to the statistics bureau. M2, the broadest measure of money supply, rose 25.7 percent, after a record 26 percent gain in April, the central bank said. The Shanghai Composite Index has jumped more than 80 percent from last year's Nov. 4 low, while the state-run China Daily newspaper reported last week that real-estate "bubbles" exist in major cities across the nation. "The failure to sell the amount of bonds planned showed rising inflation concerns," said Tang Guohui, a fixed-income analyst and trader at Industrial Securities Co. in Shanghai. "The auction result will add to the bearish sentiment." Bloomberg reports that China may keep interest rates low to cement recovery. July 8 (Bloomberg) -- China may keep interest rates unchanged for the rest of this year to cement a recovery in the world's third-biggest economy. The key one-year lending rate will stay at 5.31 percent and the deposit rate at 2.25 percent, according to the median estimate of 15 economists surveyed by Bloomberg News. Reserve requirements for banks will also be unchanged. An explosion in credit under a 4 trillion yuan ($585 billion) stimulus plan is reviving growth after trade collapsed because of the global recession. Falling exports and company profits, overcapacity in manufacturing and a rising jobless rate show the economy remains in a "critical" phase and the recovery isn't yet solid, the State Council said last month. "It's a tough decision, when to tighten," said Wang Qian, an economist at JPMorgan Chase & Co. in Hong Kong. "China's recovery is fragile, medium and small businesses are mired in losses and unemployment is rising, so the government will be extremely careful." The government is aiming for 8 percent growth to create jobs and maintain social stability after the collapse of global trade shuttered factories, costing millions of jobs. President Hu Jintao has cut short his visit to Italy, where he was scheduled to attend the Group of Eight summit, after two days of ethnic violence in the westernmost province of Xinjiang left at least 156 people dead. Mydigitalfc.com reports that Inflation may hit first in China. While China has been outspoken in expressing concern about the United States' printing too much money, those worries might be better focused at home. No country beats China when it comes to effective monetary easing. Beijing has scrapped lending quotas, adopted a loose monetary policy and kept interest rates at a four-year low to bolster liquidity and promote growth. The policy has worked. China has lent out more money in the first four months of this year than in the whole of 2008. Money growth in China is up more than 25 percent this year, versus about 10 percent in the United States. Beijing's ''monetary emissions'' will have major consequences, and China might suffer from inflation before other countries in the world [This sounds familiar... Oh right, I wrote about this six months ago! (see *****Hyperinflation will begin in China and destroy the dollar*****)]. The flood of liquidity that has been injected will almost certainly overwhelm the country's seemingly indestructible overcapacity. History has shown that China can have inflation even during times of severe overcapacity, as in 2008. So far, China remains in a honeymoon period. Cheap money is sloshing around, but thus far it has generated only asset price inflation — the sort of inflation that investors like. Meanwhile, consumer prices are still falling—by 1.4 percent in May from a year earlier. Factory gate prices were down 7.2 percent. These price declines must be seen in context [oil was hitting $140 at this time last year. Within that context, it is amazing prices in china are down only 1.4 percent. I will write a full entry on this later]. They reflect a high base of comparison last year, showing that China needs to worry more about inflation than deflation. Chinese policy makers might have misread the symptoms—the big drop in manufacturing activity late last year has been exaggerated by a sharp destocking process, which means end demand did not fall as much as the authorities thought. Beijing has prescribed a strong remedy in flooding the market with liquidity. And businesses, banks and local governments are only too happy to swallow it, for commercial as well as political reasons. Banks make money when they lend, businesses like cheap money and local government officials get promoted when local economies perform well. As one might imagine, equity prices have been the first to respond to this liquidity injection. Chinese stocks have been a top performer this year, up about 63 percent, while the Dow is down 3 percent over the same period. Next in line is the property market. House prices in America are still falling, but in Chinese cities like Shenzhen and Shanghai, they have risen by as much as 20 percent since April. Long lines increasingly form when new apartments go on sale, and the government is talking about increasing the supply to help cool the market. It will not be long before asset price inflation starts to infect the real economy. People buy appliances to go with their new apartments, and a buoyant stock market prompts investors to order shark fins for lunch. In China, the first signs of real-economy inflation will almost certainly be seen in pork prices. Over the past decade, pork prices have acted like a coal mine canary in predicting inflation. In 2004 and 2007, inflationary bursts were preceded by spikes in pork prices. A jump in pork prices in 2007 and 2008 prompted the authorities to introduce new incentives to promote pig farming, which increased supply. As a result, pork prices have dropped by 39 percent from the high seen in early 2008. Pig farming has become unprofitable and farmers have cut hog numbers as a result. This simply paves the way for another round of pork price increases. [Here is a nice graph of pork prices in China. It will be only a matter of time before inflation is transmitted to the country's factories. After destocking during the last quarter of 2008, Chinese companies have started restocking in fear of rising commodity prices, which in turn has helped drive global commodities higher. The price of goods like clothing and toys has already risen, as the export slump has forced factories to close, causing supply to drop more than demand. Goods can't be sold for under their production costs, period. The credit crisis has boosted cost of financing manufacturing operations, and these higher costs must passed on. So what if US demand is falling? If Chinese exports can't get enough to cover their costs, they will keep going out of business until the supply of goods shrinks enough for the surviving exporters to pass on their higher costs. When inflation reaches consumers and factories, policy makers will start to raise rates [or appreciate the yuan]. Asset prices might then experience a last round of euphoria as a wider spread between domestic and international rates lures foreign inflows. But higher rates will cut corporate earnings and home buyers' spending power, and asset prices might start to fall. Inflation is always and everywhere a monetary phenomenon, as monetarists like to say. China is on a money-goround ride that can only end with higher prices. Watch out for the next export from China — inflation. The graph below shows the 6 month rolling average of China's year on year money supply growth. Notice the how the Chinese M2's rate of change is now heading straight up. My reaction: Beijing has scrapped lending quotas, adopted a loose monetary policy, and kept interest rates at four-year lows to bolster liquidity and promote growth. The policy has obviously worked. 1) Chinese banks extended a massive1.53 trillion yuan ($223.9 billion) in new loans in June, more than doubling that of May's. A) China has lent out more money in the first four months of this year than in the whole of 2008. B) total lending so far this year is 7.4 trillion yuan, far exceeding the country's initial full-year target of 5 trillion yuan. C) 7.37 trillion yuan is almost 25 percent of China's 2008 gross domestic product. D) New bank lending in the first half of this year is up 200 percent from the same period last year. 3) The new-loan total for June was much higher than the estimate of 1.2 trillion yuan given in recent days by state media, suggesting a loss of control on the part of Chinese authorities. 1) Chinese M2 (broadest measure of money supply) rose 25.7 percent in May, after a record 26 percent gain in April. 2) The Shanghai Composite Index has jumped more than 80 percent from last year's November 4 low. 3) Real-estate "bubbles" exist in major cities across the nation. 1) China is seeking to choke off supply of money to speculative stock-market and real-estate investments, without derailing its 4 trillion yuan economic stimulus plan by raising borrowing costs. 2) The People's Bank of China has resumed sales of 12-month bills, suspended since mid-November, to drain cash from the banking system. 3) The PBOC auctioned off a combined 100 billion yuan ($15 billion) of bills this week, the most since September 23. 4) The PBOC's efforts to drain funds from the financial system has already started to nudge up money market rates and prompted a partial buyer's strike in the bond market on Wednesday. 1) China failed to complete a 28 billion yuan ($4.1 billion) government bond sale for the first time. 2) The failure to sell all government bonds in an auction is quite rare and shows rising inflation concerns. 1) economists were unanimous in expecting no change in borrowing cost rates or banks' required reserves in 2009 or the first half of 2010. 2) Chinese officials imposed an overnight curfew in Urumqi, capital of Xinjiang, for a second straight day, after ethnic Han and Uighur people fought in the streets with machetes, pipes and bricks. 3) The strife has also left more than 800 people injured since July 5, which explains why Beijing is so determined to keep the economy growing fast. 4) China will keep interest rates unchanged for the rest of this year to cement a recovery in the world's third-biggest economy. 1) China's consumer prices dropped 1.4 percent in May from a year earlier, after falling 1.5 percent in April. 2) At this time last year, oil was hitting $140. Within that context, it is amazing prices in china are down only 1.4 percent. 3) China's CPI numbers, which reflect a high base of comparison last year, show that China needs to worry more about inflation than deflation. 1) In China, the first signs of real-economy inflation will almost certainly be seen in pork prices. 2) Pork prices have dropped by 39 percent from the high seen in early 2008. 3) Since pig farming has become unprofitable, farmers have cut hog numbers as a result, paving the way for another round of pork price increases. 1) Higher commodity prices and more expensive financing have increased the cost of Chinese manufacturing operations. 2) In the face of falling global demand, Chinese exporters weren't able to pass on these higher costs, forcing many factories to close down. 3) The big drop in manufacturing activity late last year has been exaggerated by a sharp destocking process, aggravating this supply destruction. 4) The price of goods like clothing and toys has recently risen, showing that supply destruction has reached a point where Chinese exporters can pass their costs on. 1) Beijing's massive stimulus efforts and monetary easing will have major consequences, with China suffering from inflation before other countries in the world. 2) Supply destruction among exporters and looming domestic inflation mean the next big export from China will be inflation. Conclusion: Make sure you read *****Hyperinflation will begin in China and destroy the dollar***** If you haven't already. It explains pretty much everything that is happening in China now. It is weird that deflationists cannot see that overall, including the increase in Government debt and increase in credit and money supply in countries like China, there is no overall contraction of credit. When you tell them that they expand their definition of credit to include "stock market and home wealth" which has been lost.What's next? Derivatives collapsing means another $100 trillion of deflation? If China exports inflation in the US (i.e. make Chinese goods a lot more expensive), then it is a good thing for many people. Aren't there complaints and requests for tariffs on Chinese goods. (Unfortunately, in the case of the tariffs, it would go to the government, and the US would not benefit from this.) Besides, the US can outsource to Mexico. Hopefully, this inflation would reduce the competitiveness of Chinese exports. I remember Jeff Rubin stating the higher oil prices in the 150s would wipe out the wage advantage in many imports because of increased transportation costs. Perhaps, a negative inflationary effect would be a revaluation of the Chinese currency and this would increase their demand for energy. The whole world can ignore Weimar and Zimbabwe. Not to say that their life is worthless, but the fact is their size if ignoreable. How many mark or zimbabwe dollar that every countries keep in their reserves? Not much... if not at all. But how many USD that every country keep in their reserve? PLENTY. So if USD hyperinflate, what is it going to hyperinflate against? All currency is doomed if the USD is doomed! So the logical conclusion is we are just not going to have hyperinflation. The credit bubble is over. There will be no (sustainable) inflation. @Jane I have been reading your coments, and I have to tell you they make no sense. They are just wishfull thinking, combined with weird and wrong logic. Just because something is bad it doesnt mean it will not happen. You people make economy so complicated. "So if USD hyperinflate, what is it going to hyperinflate against? All currency is doomed if the USD is doomed! So the logical conclusion is we are just not going to have hyperinflation. The credit bubble is over. There will be no (sustainable) inflation." There's a major flaw in your logic. You're saying if all currencies hyperinflate, there will be no inflation. What about against "stuff"?! Hyperinflation is always about the "value" of currency against real stuff, not against other currencies. That'd be exchange rate. It's all working out perfectly, ain't it? I'm amazed how everyone is happy to buy the Fed/Treasury fairy-tale about US industrial capacity slack and its counter-inflationary effects. Over the last 15 years, since the US began seriously exporting its industrial production overseas, there was hardly any correlation between industrial capacity utilization and CPI, but the correlation between price of imports and CPI was near perfect. The US has been re-importing its inflation (which it was [ironically] exporting via the fiat US$-financed deficits in the first place) for at least 15 years. A spike in Chinese inflation will be even worse if you consider that retail inventories are at record lows in the US. Restocking + import price inflation + huge monetary base growth = a real HE inflationary mix! But I think we gonna have a bit more of deflation scare first which will force Bernanke abandon his tactic of dishing out funds to zombie banks (a recipe for a liquidity trap, hasn't he learned that from his guru Friedman?) in favor of REAL helicopter money which will make the HE mix described above even more powerful. Bank profits don't matter as long as they are made on commissions on US debt resale. Corporate profits don't matter for the general economy as long as earnings are falling. So deflation scare is gonna come back, and prevent any monetary policy tightening. Things are just turning out so funny.. In the "not enough income" column he says: "Domestic goods and services become cheap" (I say maybe to people using currency other than the dollar) but he also says underneath that "debt payments become expensive". In 3 min and 9 seconds he talks about how inventory gets depleted and is going to have to be restocked BUT TO RESTOCK YOU HAVE TO BORROW MONEY!!!! (He also mentions most of this inventory is from China anyway). But this is my point, To restock shelves you have to borrow money but borrowing money will become more expensive, where will this money come from to pay the rising borrowing costs? Obviously the only way is by raising prices. He also talks about companies trying to raise cash and so far they are doing it by issuing more stock, obviously this isn't enough(it will fail just like the govt. 's issuance of more treasury bonds to pull in cash) and the other means to raise cash will be by raising prices of their products. Lower prices are the opposite of what these companies need to do to stay in business. They will soon realize this when the majority of businesses are closed down because of this failed business plan. Expect rising prices. Also check out this vintage pro-inflation propaganda video. At 6 minutes and 52 Seconds in the video it explains how inflation effects(helps) a man(farmer) in debt. market is about lending money. If there is no lending, there is no stock market. And this is how credit will end. First we had talks of a V shape recovery in the spring, now they are talking of an L in the summer, in a couple months stocks will make new lows and the fall will bring the fall of the stock market and the dollar along with it. "4) The price of goods like clothing and toys has recently risen, showing that supply destruction has reached a point where Chinese exporters can pass their costs on. I think what seperates inflationists and defaltionists today is the time each believes it will take America to reach this point of supply destruction. Defaltionists believe we have so much stuff in this country that supply destruction will take a long time(10 years) before it reaches that point where we have a shortage of stuff and decide to raise prices(to slow the destruction of supply) instead of let more supply be destroyed. Inflationists believe that all the stuff we claim to have is not enough to fill the need of the population of China and that the supply destruction only has at most a couple years before it reaches that point where we have a shortage of stuff to force us to raise prices(to slow the destruction of supply) instead of let more supply be destroyed. Of course the inflationist is the correct one as this blog article is proof of it. Even Mike Shedlock's view on China and Inflation(which I believe is a direct reaction to Eric's "Hyperinflation will begin in China" blog) is weak. He quotes an article and the key point of the article to me is: "The government's current investment stimulus is tapping a money pool accumulated from past exports. Eventually, the pool will dry up.
" 1. This is all too familiar because this is exactly what America did and exactly how any emerging country grows in today's world of credit. 2. It's funny how defaltionists see the supply of things as over abundant but the supply of the money that was exchanged for those things as insufficient. He gives absolutely no reason to believe that China is not going to go far with it's stimulus plans. As if China's reserve supply is not large enough and that it will run out quickly and that China will be in the same debt deleveraging position we(Americans) are in today without going through the same expansion we went through. That's just foolishness. When the guy says China will fail, what exactly does he mean by fail? He can't possibly mean that China will fail at expanding credit. as far as failure, the only failures I can see is China failing at finding enough products to spend it's increasing money supply on. This means prices on things will rise. The article Mish quoted is strongly suggesting rising prices and Mish offers little to no commentary about it accept to just say what he wants to believe what the article is saying. Eric, I love this particular blog. 4) The price of goods like clothing and toys has recently risen, showing that supply destruction has reached a point where Chinese exporters can pass their costs on." I just realized from reading this that inflation(I mean rising prices for those Austrian Economists) is inevitable from both sides of the aisle. 1. If China continues to expand credit, there will be too much money chasing not enough goods. Which will cause prices to rise. 2. If China decides to "choke off" the money supply and stop expanding it's credit, the tightness in credit will increase borrowing/financing costs(on top of that due to the crash in exports they will not be getting the US dollars which acted as a subsidy to pay those rising borrowing costs to stay in business) and cause factories to close down the same way the rising financing costs are affecting the West. This supply destruction will have the same effect and cause a shortage of goods and will lead to rising prices anyway as you just pointed out with the rise in price of clothing and toys in China. Here I was thinking that China wouldn't be effected by the shortage of dollars/credit contraction like the US is and China is effected by the credit contraction just as we(Americans) are. Because of a lack of dollars, China will suffer the same effect of rising borrowing/financing costs as we will. And like us China will be forced to close it's factories if it can't pay those rising borrowing costs. So it's like China was borrowing from us even as we were borrowing from China. In fact that's probably the reason for the peg. So that when we buy from China since our money is pegged to be more valuable, some of that money is used as a subsidy for the rising borrowing costs due to the extreme tight credit regulations China has had over the last decade. Now that exports have crashed and those dollars are no longer flowing in to China, China has lost that subsidy for it's rising borrowing/financing costs and factories that are not able to pay these rising borrowing/financing costs are forced to close down. The liquidity of the dollar was holding it together and now that that is coming to an end, the system is breaking down and all currencies will be effected. So we can time trouble in China at the same time as trouble in the US as the liquidity of the dollar is effecting us both in the same way. So there's no way around it, rising prices are inescapable. As far as timing I still say we have less than 2 years, probably a year.